Some characters never seem to die even when you think they already have and they just don’t know it yet. Years ago it seemed like, pardon the pun that the character of Rocky Balboa was on the ropes and ready for a knock out. Somehow though he survived and with the film Rocky Balboa Sylvester Stallone was able to leave the ring with his head held high and us fans happy with where the story left us at the top of those famous stairs. That changed with the release of Creed as it was like a familiar lightning bolt struck and just when we thought we were out, we were pulled back in, but can lightning strike twice? Not wanting to break from a winning formula Creed, like Rocky before it ends on a losing note, but thats what sequels are for. It doesn’t take long for this sequel to do that as we see Adonis Creed (Michale B. Jordan ) win the heavyweight championship of the world. Things are good at the top as he and Bianca (Tessa Thompson) get to enjoy their new life for a while, that is until someone from his past shows up with a challenge. The man who took his father’s life, Ivan Drago (Dolph Lundgren) who has a son in Viktor (Florian Munteanu) who is a fighter as well and is looking for someone to break. Adonis feels that this is a fight that he cannot pass up because of the history between Ivan and his father. This is really the classic good news/bad news situation with Creed II. Knowing you always want the bad first, lighting does indeed not strike in the same place, but the good news is it isn’t a bad movie at all. Gone is the magic the first one had and it has been replaced with playing it safe and following into old sequel routines. With Creed director Ryan Coogler and Michael B. Jordan made their own movie that just happened to have Rocky in it. The film had heart and a story that made you take notice, both which are missing in this one. Knowing Coogler was not returning already put doubts on what this could be and while the story not being as good is understandable, the lack of heart is not. That is a problem when the film, directed by Steven Caple Jr. really focuses on family, but instead of caring about it you are left looking at your watch. The other thing Creed II is not is original, as the story and the boxing scenes have a ‘seen it all before’ vibe. The good thing is that both Jordan and Thompson are great and its good to see Lundgren again and with Stallone being Rocky is like second nature. 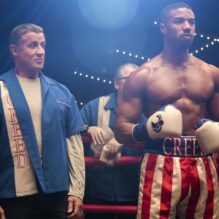 The performances are just enough to make the film a little above average which is a big dip at the new classic Creed has become. This one does not go down for the count, but it barely makes it back up and you leave feeling that instead of greatness the filmmakers settled on just getting through the end of the fight.